News articles, tips, new products and more.....check it out! While fires rage in the drought-stricken Southwest, summer is off to a soggy start in many parts of the country. That can spell trouble for lawns and lawn equipment. Here's how to keep your lawn looking crisp and your mowing equipment in tip-top shape. Also, clean the mower's tires with a wire brush. Finally, wipe down the top of the mower to remove wet clippings, and fill its gas tank to remove air. Most grasses in the particularly damp areas of the country are cool-season types. These grasses grow best with a long leaf of 3 to 4 inches. Most homeowners, however, cut these grasses way too short, and that problem is magnified in damp mowing conditions. The mower can't handle it. Move the mower deck up to the highest or the second-highest setting and leave it there. Use stabilizer every time you fill up your mower's gas can, and be sure to buy no more fuel than you will use in two to three weeks. The ethanol in today's gasoline has an affinity for moisture. Stabilizing the fuel and going through your fuel supply as rapidly impossible prevents fuel contamination. A sharp blade produces a crisp cut, and this keeps the grass healthy. It's particularly important during damp mowing conditions, when the blade will have a tendency to shred rather than cut. 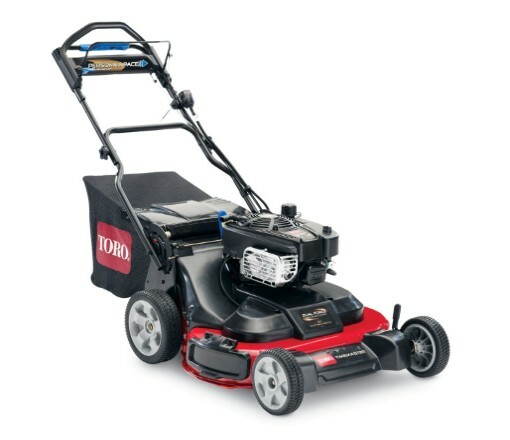 Toro says its TurfMaster 30-inch mower covers more ground in far less time, yet it’s surprisingly easy to handle. A highly productive 30-inch deck cuts a wider swath than 21-inch mowers. The precisely timed, twin-blade cutting system powered by a tough Kawasaki engine provides a clean, professional look. Designed for durability, the mower features a cast aluminum frame, heavy-duty steel deck and a bull-nose front bumper. Versatile — 3-in-1 deck design provides mulching, bagging or side-discharge. Control System — Single bail design is simple to operate and easy to control. Blade Stop System — Allows the operator to disengage blades without shutting off the engine. Two-Point Height of Cut — Durable design easily adjusts front and rear without walking around the mower. Commercial-Grade Wheels — Tough co-polymer wheels feature precision ball bearings for long life with less downtime and lower replacement costs.